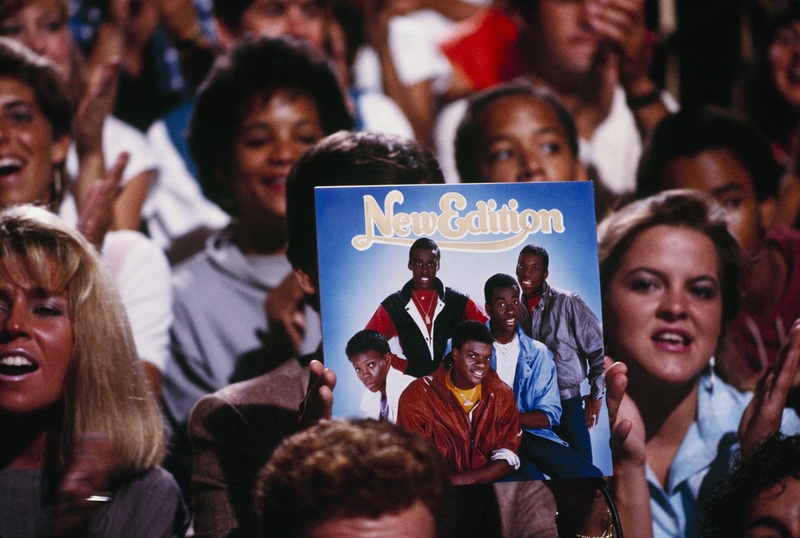 It was 1986, and New Edition needed a slam dunk. The all-male singing collective from Boston housing projects was on its way to becoming a true supergroup — but only if its remaining members could convene and create the album that Jheryl Busby knew they had in them. Busby, who began his career at Stax Records and became president of Motown, was then president of black music at MCA Records. 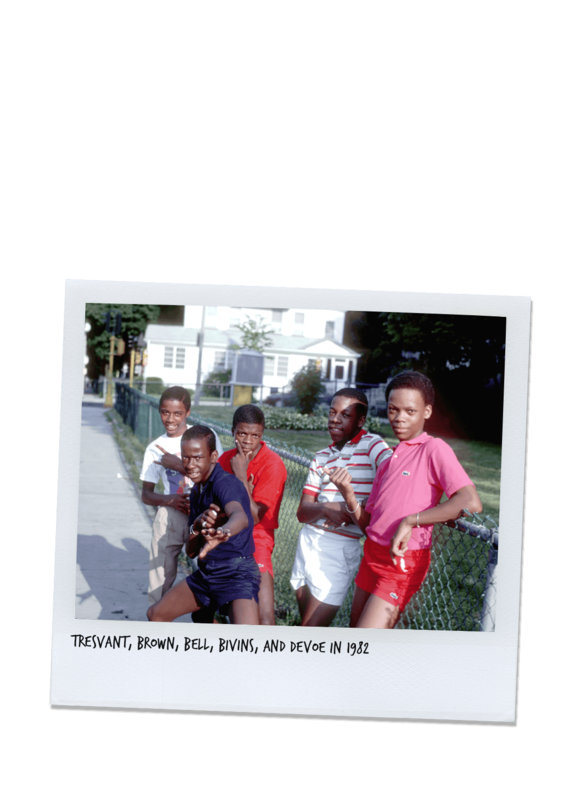 New Edition, founded in the Orchard Park Projects in Boston’s Roxbury neighborhood in 1978, was down to four members: Ricky Bell, Ronnie DeVoe, Michael Bivins, and lead singer Ralph Tresvant. Bobby Brown had been voted out of the group in 1985 due to his on-and-off stage antics, and he was prepping for his second solo album, the instantly classic Don’t Be Cruel. 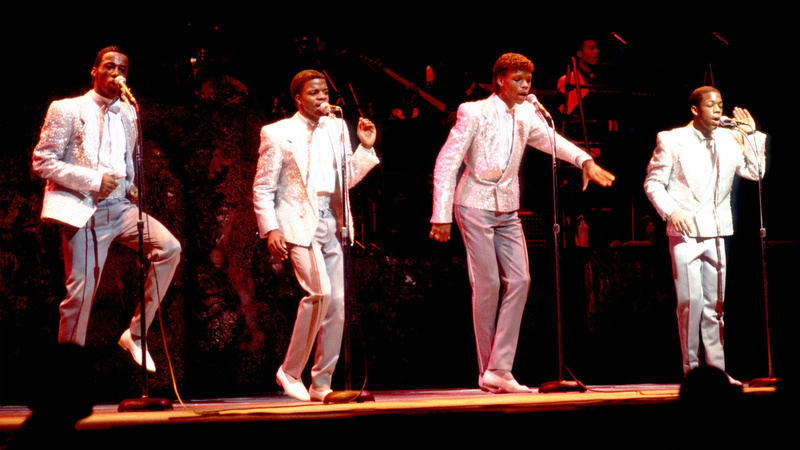 New Edition had experienced multiplatinum success with its second effort, 1984’s self-titled album, and 1985’s platinum-selling All For Love secured its space as the signature teen group of the mid-’80s. But the group’s fourth effort, 1986’s Under The Blue Moon, was a collection of doo-wop covers that barely went gold. To add to the disarray and disappointment: Back taxes were stressing out Bell, DeVoe, Bivins and Tresvant — and they weren’t even 20. They were the teen idols who made black girls born in the ’70s rip pages from magazines like Right On! and tape them to their bedroom walls. 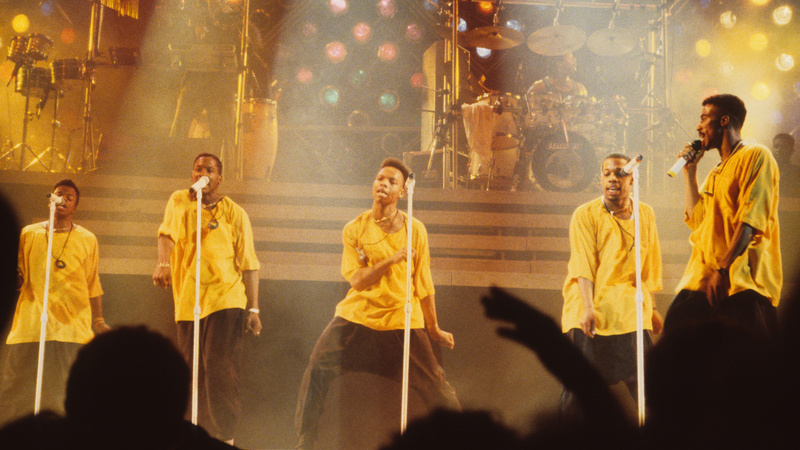 New Edition’s Candy Girl, Popcorn Love, and Mr. Telephone Man soundtracked skating rinks on Saturdays, and was the type of music designed for hand-holding and first time slow-dancing. The idea that this group was somehow on the verge of breaking up would have been inconceivable to the legions of fans it amassed during successful domestic and international tours. They needed to create another huge album. And Busby — who had been instrumental in the crossover careers of Jody Watley, Patti Labelle, and Gladys Knight — paired New Edition with Jimmy Jam and Terry Lewis — two members of Prince-associated Minneapolis band The Time. Jam and Lewis were hotter than hot. They’d worked with Janet Jackson, the youngest member of the Jackson family, garnered insight into her life and helped her create Control, which sold 5 million copies, is easily one of the best albums of the 1980s — and certainly one of the most transformative albums ever recorded. 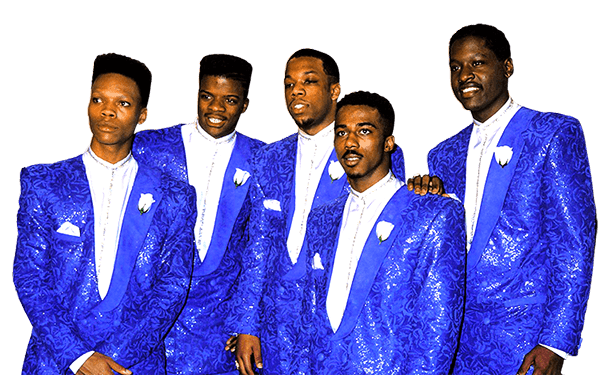 This week, the group receives its long overdue star on the Hollywood Walk of Fame, right before BET presents the much-anticipated origin story of New Edition in an excellent, unfiltered three-part miniseries that all of the group members helped to produce. But this is the story of Heart Break: the best-selling album that catapulted them to icon status, launched Tresvant and Gill to platinum solo careers and set Bell Biv DeVoe off into the pop stratosphere. These conversations took place in the autumn of 2016, and have been edited for clarity and length. Everyone quoted is identified by the titles they held during the Heart Break era. Record executive Jheryl Busby had a master plan. He was ready to help transform the group and help them create the music they’d been asking for. Jheryl Busby was the kind of record company executive that wasn’t just about the dollars. He was about sound, and he knew Jam and Lewis could deliver. They were the people to call if you wanted a good, solid album — not just a couple of singles. They had been on this trail with Janet [Jackson] and … had the track record of just being hit-makers. The industry was on fire for them. The initial meeting was with just four guys. Bobby had left, and Johnny hadn’t come in yet. We had a meeting, and we got a direction in terms of where we were going to go with things. Bobby had left, and Ralph was not really threatening to leave … but he was looking to go solo. It was a challenging time in our careers. We had so much success with Candy Girl, and even our second album, and our third album, [1985’s All for Love], which was the Count Me Out joint. At that time, we had different management, and they were trying to take us in a direction we didn’t want to stay in. They wanted us to remain bubblegum — the kids’ stuff. They didn’t allow us to grow along with our audience. They wanted to make an album that was representative of where they were in their lives. They weren’t kids anymore. [Jimmy and Terry] had this heat around them that was going to add additional attention to the group … bring out better vocals than we’d been doing — just controlling our vocal style and sound so we could come off a little more of the age that we were. The record company was leaning us toward Cool It Now type of songs. We wanted to take the things that made New Edition great — harmonies, catchy lyrics — and just grow it up a little bit. We were trying to take … the groundwork that Maurice [Starr] started, their MCA albums — and update it. The best part of Heart Break is we approached it [having] tax problems. When we went to record, and broke out of a bad record deal, each man [owed] a quarter of a million dollars in back taxes that we knew nothing about until we started cleaning up the business. We brought an attorney in who changed the deal, and got into our personal lives, and said, ‘By the way, you owe 250, you owe 267, you owe 285, you owe 290.’ How about those apples? So at 19, 18 years old, we’re wondering, Where is it going to come from? I stayed because we needed to come back together to do another album. There was some financial stuff going on … We needed to make another run. The basic concept for us is always the same. We try to get to know the artist before we even musically try to do things. We try to get know their stories and concerns, their loves and likes and dislikes. It gives you a flavor of what, to me, the creativity should be on the record. Very similar to Janet, and very similar to all of the artists, pretty much, that we [work with]. 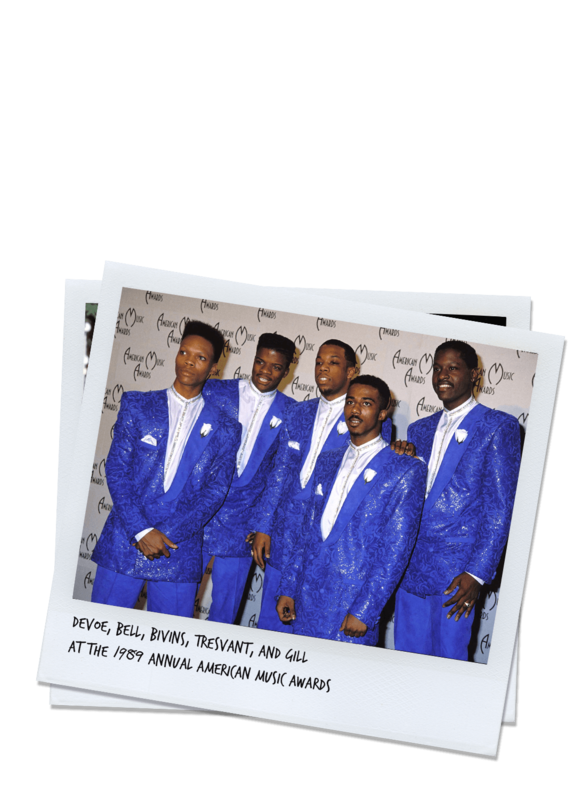 I was in the process of working on Don’t Be Cruel, so I wasn’t really concentrated on [New Edition]. [But when] I heard they was working with Jam and Lewis, man … it was just like, that’s been a life dream of mine to work with them. I was working with Babyface and L.A. Reid and Teddy Riley, and I just knew [all] of us had hot new producers. Our management [at the time] was like, ‘I think you guys should stay away from the Jimmy Jam and the Terry Lewis. You should be with Teddy Riley … because that’s the new s— that’s happening.’ But we trusted [Jam and Lewis], and we were excited about working with them. We felt sure about them, trusting them, and following their lead. One thing New Edition always thinks about upfront, is how it’s going to work onstage. So that was always a first consideration building for them. Even down to how rhythmic some of the music became — so it would facilitate their choreography. That’s also very similar to Janet … that’s one of the things we always keep in mind, and she always keeps in mind. The group took a big hit when Brown was put out of the group. To this day, people debate about why he wasn’t in the group [after 1985’s All For Love]. But the bottom line is, they needed to expand their fan base. When New Edition got started, most of their fans were females. They wanted males to enjoy their music, too. In order to move past that bubblegum stigma, and to be taken seriously as a young male recording group — kind of like The Temptations — they were going to have to come up with a new sound. They were going to have to have at least one more key vocalist that could be a lead. Jheryl asked us, If we were going to sign a male artist, who would it be? [Jimmy and I] both said, ‘Johnny Gill!’ Jheryl said, ‘Well, if I sign him, will you guys produce him?’ We said, ‘Absolutely. We love Johnny.’ Jheryl went out and signed Johnny. Unknown to us, his plan was to put Johnny in New Edition. Five members of New Edition showed up at the Flyte Tyme studios in Minneapolis. The surprise to some was choirboy Johnny Gill, who at that point had two R&B hits with former girlfriend Stacy Lattisaw in 1984. No one seems to remember the exact day or month 30 years ago when the guys first met in the studio. But they certainly remember what all transpired. It was the middle of winter. We’d have snowball fights. We’d try to get out of the hotel first, so we could check anyone else coming out, and bomb them with snowballs! We also used to get these wings from around the corner of the studio. And rightfully so. Ralph didn’t know what was going on with us putting Johnny in the group. Jam and Terry didn’t know what was going on. There was a massive conversation that went through all kinds of ups and downs. I wouldn’t be surprised if there was some tears shed. It was damn near on the verge of fisticuffs. I had nothing to do with Johnny coming to the group. Johnny was being brought in as the new member — at the time — for me. When we first got to Minneapolis, I was like, ‘What is he doing here?! Why is he here? !’ Because I had no idea he was going to be down there when we got there. We had to figure out how we were going to do this. We weren’t necessarily against it, but we certainly weren’t immediate fans of putting Johnny in the group. We had already structured things a certain way in our minds, with the voices and the personnel that were there. I felt backstabbed. I felt betrayed. I felt like, ‘Yo, you guys are just going to bring somebody else back into the group? !’ I was very upset. The rest of the members just stabbed me in the back right there. I remember running into Bivins … at a Whispers concert in Los Angeles. We had a conversation, and then I was invited to dinner. We went to lunch, and from lunch we had another dinner, and then another. From that point [I was] meeting [with] the guys and talking, and then it led to the fact that they wanted to go back to a fifth number … Little did I know all the internal stuff that was going on. I’m walking in completely blind. I realized later what the situation was. That I was coming in to replace Ralph. We had a really down period. We weren’t doing anything. We weren’t on the same page about the direction of the group. Ralph was doing his solo thing that came to our attention, and it was really tough emotionally. I put it on the shelf and never revisited it [a successful self-titled album was released in 1990]. Some of the stuff that I was doing [at the time], the style I was coming with, Bobby was coming with that style — a New Jack Swing style. The two dancers in the back. I didn’t want to come with that flavor. We gave up so much. We left school. I gave up playing ball, so my dream of the NBA — whatever it was going to be, one out of a million — was sacrificed. A lot of soul-searching. So Johnny, honestly … was this savior to the group — we had instability for us and our families at that point in our careers. I don’t think Ralph was thinking about leaving the group. Ralph was just wanting to do his own solo project. It was about having the freedom to express himself artistically. Being in the group, you’re bound to certain things … everybody has to agree on what you’re going to sing and who’s doing what parts. At some point, you become a bit frustrated. It wasn’t about leaving the group, but I think the group thought, ‘If he goes out and does the solo stuff and becomes successful, he ain’t never coming back.’ That was their thought process. Heart Break was a very tough album to get off the ground. I was on the fence. I can’t lie and say it was like, ‘Oh, yeah, great!’ I kept thinking, ‘I don’t dance!’ I was trying to figure out, with my voice, where do I fit in? The very first time that we sat down with Johnny was actually at my house in Woodland Hills, California. He comes over, and it’s myself, Ricky, Mike, Johnny and my Uncle Brooke, who of course is our manager. And this is the first time my uncle is finding out that Johnny is potentially going to be in New Edition. Our thing is performance — it’s dancing, choreography. One of the first things my uncle wanted to do was teach Johnny … a couple eight-counts. He had two left feet. I gave him a couple of steps to do, and I was pissed and yelling at everybody after I seen him. I thought they all were crazy. Jimmy and Terry told me, ‘You probably won’t be doing any lead singing on the album.’ And I said, ‘Hey, not a problem. I’m here.’ My logic behind it was being a part of a basketball team. Everybody has a role. Johnny was asked … not only [to] help us, but help his career as well. The tension began to ease, and we were able to make a crack at the record. Johnny became a good listener for me. We sat, and had a chance to get reconnected. He had no idea he was brought in to replace me. Once we smoothed that out, we started working. Janet Jackson’s Control cemented Jam and Lewis as leaders of the new pop sound. The production duo was now ready to do something metamorphic for New Edition. We’re playing basketball, we’re watching movies. Talking about life. We realized Jimmy and Terry were getting information all this time. Writing down notes, or taking notes mentally … about ideas, thoughts, goals, directions of the group. And then we started hearing, like, ‘This is where it all started from …’ We started hearing titles that sounded just like what we’d been talking about. That’s how they formulated the album. Watching our personalities, watching the group’s personality as a whole. It was about us having a voice. It was the first time since we’d worked with Maurice Starr that somebody sat down with us and actually had a conversation about what we believed in. They’ve always had the Jackson 5 influence. Our whole thing was to take those elements and fuse them into something new. If It Isn’t Love works well because it has familiar elements that they were comfortable with and that the fans enjoy — but that just grew them up. Ralph’s vocal performance on that song is amazing. You can write and produce the best song in the world [but] if the artist doesn’t put their heart and soul into it, it doesn’t work. When they started playing If It Isn’t Love, I felt like, ‘OK, there it is. That’s that sound, that bridge between what it was and where we’re going. We’re trying to grow up in front of everybody now. We have been asking for it, and we’re doing it.’ It hit everybody like that, from the record company on down. Brooke was there some of the time, but his presence was always there. His presence was instilled in the guys. The breaks in If It Isn’t Love are there for choreography. That song was simply amazing, when I was hearing it from the beginning and then building up to the drum pattern … just the licks in there, those were the things I was asking for. I could visualize what the choreography would do. Can You Stand the Rain, is probably my favorite New Edition song of all time. The production of it, the harmonies, the melodies. From the first words on, just the way Johnny performed it, and Ralph coming after it. That was one … that I remember pretty much doing most of the vocals on. I remember some of the ad-libs I did, that Rick came in and he redid some of the ad-libs that I’d done. We was just in the moment, just doing what we do. I found myself on You’re Not My Kind of Girl, talking. I found myself getting that one line in Can You Stand the Rain. Can You Stand the Rain is the story of love in itself. Everybody can be in love when it’s easy, but can you hang around when things get a little tough? I think they all at that point experienced that. Creating songs with them and watching them come to life, and watching them bond … because remember, the underlying theme is that you have guys that have been together this whole time, and now you have a new member. Johnny wanted to be part of the group, so he did whatever was necessary so he could fit into the group. It was difficult for solo artists back then. You had to have a lot of magic, and a lot of behind-the-scenes power to propel you to superstardom. So … it heightened his visibility and he enjoyed it. Johnny didn’t mind transitioning from a lone, solo artist to being in New Edition. We mentioned to [Jam and Lewis] that we, New Edition, were getting overlooked [by the mainstream]. We were venting. The commentary on [Where It All Started] it’s just a reminder, like ‘don’t forget that.’ People are going to try to duplicate what we do, but this is where it all started. It’s just them staking their ground. And telling people [like former manager Starr’s new, all-white, Boston-bred New Kids On The Block] that ‘this is our stuff. We did this first.’ There was no ill temper, but more the pride of being the trendsetters — the ones to do it first. [The song] definitely said what it was supposed to say. 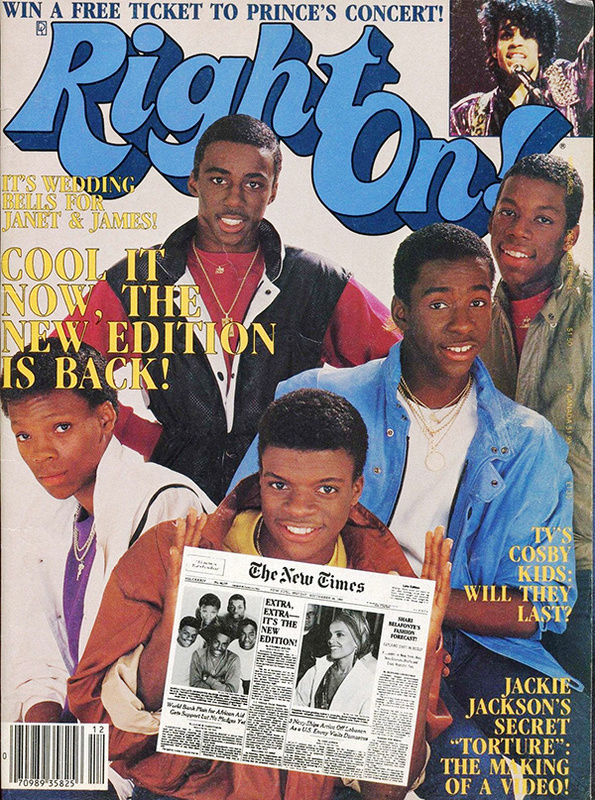 New Edition always does that — even without me. N.E. Heart Break was more the guys’ experience. I mean, we had been on the road too, and probably shared some of the same experiences, but that was self-expression for them. The skits are hilarious. Some of them were really organic. We’ve always enjoyed doing the little interludes. When we were making records at the beginning, there was no music video. And Prince used to tell us to make records visual: ‘If you listen to a record, you should see something.’ So, for us, it was always about the things that happen in sessions that people don’t get a chance to see. The last song we wrote for the album was Boys to Men. Johnny thought the song was wack. He couldn’t understand — with all these other great songs that he could have sung — why this was the song we gave him. I didn’t get it. But we both knew what that song was. What it was saying was important. That song’s brilliant. The introduction to what Johnny could really do was in Can You Stand The Rain, and he laid it down in that song. That really said, ‘This is what I’m bringing to the group. As a vocalist, this is my strong point.’ And [Boys to Men] showcased it in a real way. He thought he needed something more popular. And so when we told him, ‘Hey, man, this is going to be a very important song to young men out there trying to figure it out.’ Finally, we got him to do it, and he put his heart into it. Johnny Gill was going to turn down [his Grammy-nominated] My, My, My. He’s a great singer, but I’m not giving him any A&R cred! Heart Break was released on the same day that Bobby Brown released Don’t Be Cruel. Heart Break went platinum in three months, and today is quadruple platinum. New Edition continues to tour successfully with and without Brown. The climate changed. We didn’t know what Bobby was making over there on Don’t Be Cruel, but we knew it was funky, it was coming. My personal thing that I put on the table, [was] those two cars on the cover. And that’s what we ended up doing. Two cars with the fly suits and then they found that location over Mulholland Drive with the city in the back. We’re older now. Let’s get out of these sweatshirts … and that became our iconic album cover. 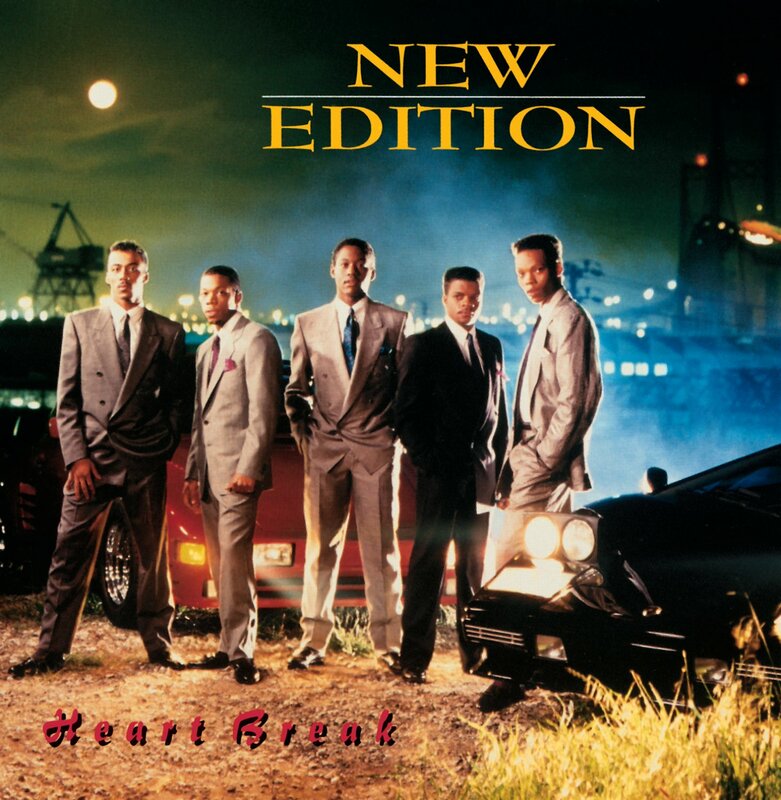 I loved it, because of the sound that Jimmy and them gave New Edition — that grown-up, funky sound. I was in awe. It was good to be back around the guys, even if I wasn’t on stage with them. It was just good to be around them again. When I first got the music … Can You Stand the Rain really resonated. But with Johnny as a lead vocalist, that song was so outstanding. I knew they had successfully made the transition. Heart Break, I believe, is that album that captured the essence of who we were. The best part of Heart Break, besides the music, is we were able to get that debt off our back. We’ve grossed the most money [with the] tour, ever in life. God blessed us because we were smart enough to remember there’s strength in numbers and we worked through this stuff, and that was the biggest blessing we ever got. And it just gave New Edition more years. I think there will be a rediscovery of the album because of the New Edition miniseries. People who haven’t heard those songs will rediscover it, and I also think the miniseries will give the proper importance to the group, and why historically in music they should be revered, on a high level, as we do with the greats — The Jackson 5, The Temptations. Without Jam and Lewis on the record, I don’t think we’re here 33 years later, able to tell our story. The reality is, and will always be, we were in a moment. Nobody — I don’t think — really understood the history that was being made. 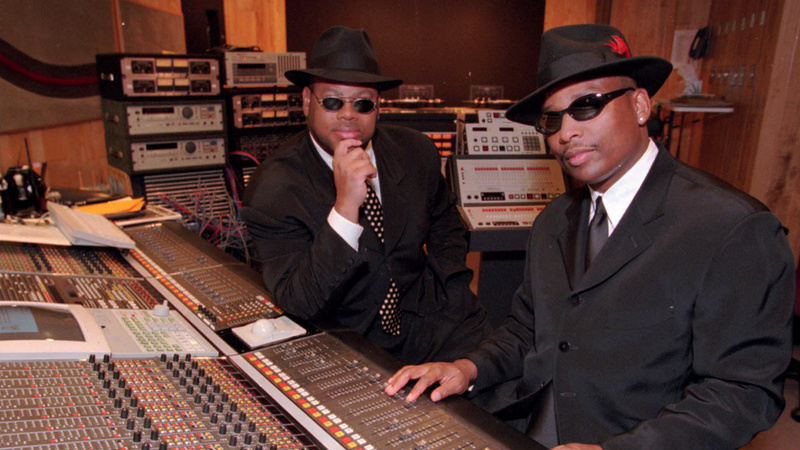 Jimmy Jam and Terry Lewis: As a duo, they have amassed more Billboard No. 1 hits than any songwriting and production team ever. They also are in a small fraternity of music producers who have had No. 1 songs in three back-to-back decades: the ’80s, ’90s and 2000s. Ralph Tresvant: His 1990 solo debut went platinum and produced a No. 1 with Sensitivity, as well as two top 5 hits with Do What I Gotta Do and Stone Cold Gentleman, which featured Bobby Brown. Bobby Brown: His second solo album Don’t Be Cruel, went seven times platinum, and is one of the most influential albums of the New Jack Swing era, paving the way for artists like Usher, Chris Brown and Justin Timberlake. 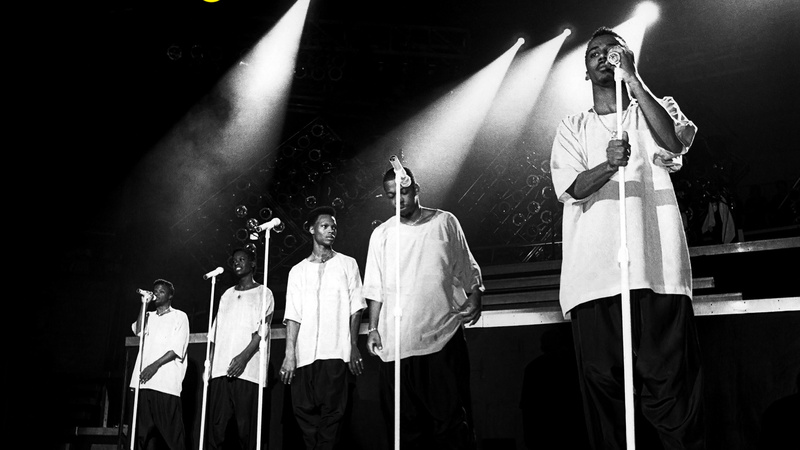 He later recorded with New Edition for the 1996 Home Again. Brown released his fifth solo album, The Masterpiece, in 2012. Johnny Gill: His 1990 self-titled solo album produced four hit singles and earned a Grammy nomination. In 1997, Gill teamed up with Gerald Levert and Keith Sweat to form LSG for an album that went two times platinum. Gill also toured with Tresvant and Brown as “Heads of State.” Last year Gill released a new track, This One’s For Me and You, which featured New Edition. Michael Bivins: Together with Ricky Bell and Ronnie DeVoe, he is a member of Bell Biv DeVoe. Their four-times platinum debut, 1990’s Poison, is an influential mix of R&B, hip-hop and pop music. Bivins as an executive is credited with discovering and managing Boyz II Men to their historic successes — as well as Another Bad Creation and 702. This month Bell Biv DeVoe will release a new album, Three Stripes. Ricky Bell: Lead singer of Bell Biv DeVoe, which releases its fourth album Jan. 27. The group released a new video for well-received single Run last year. Ronnie DeVoe: Besides touring and performing with New Edition and Bell Biv DeVoe, he also is the owner of DeVoe Broker Associates, an Atlanta-based realty firm. Cynthia Horner: Runs her own media relations company besides serving as editor-in-chief of Hip Hop Weekly. Brooke Payne: Choreographer and manager for New Edition. And we make a strong case for New Edition’s induction in the Rock & Roll Hall of Fame.